I used Baked Lay’s to lessen the guilt just a tad. (I know, like that’s really going to help.) Just start squashing the bag with your hands to get perfect, crumbled bits of chips without any mess. The cookies bake up deeply golden brown. The recipe says to bake them for 18 to 20 minutes, but in my gas oven, they were done in about 15 minutes. So, do check them early just to be on the safe side. These cookies are all about the texture. They emerge full of crunch. They’re not nearly as salty or sweet as you would think. 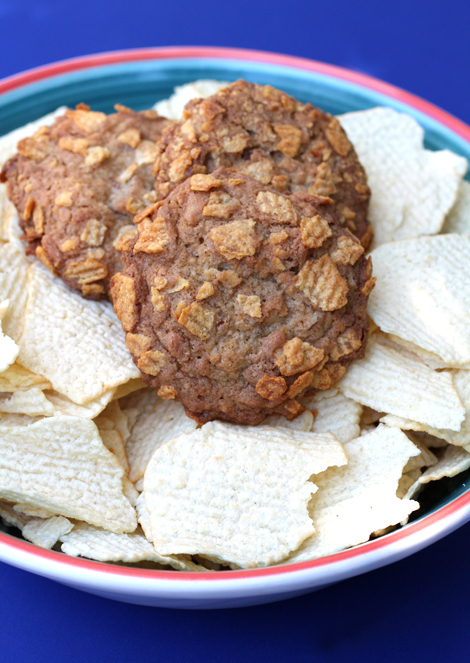 The flavor is quite subtle, with chopped pecans lending a faint nutty note. The recipe says it makes about 18 cookies. But I got about 30 cookies by making them only a pinch smaller. 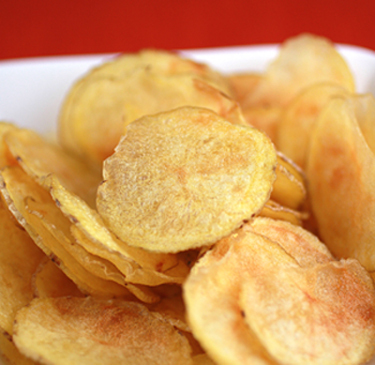 Like potato chips, themselves, you won’t be able to eat just one. Preheat oven to 375 degrees. Beat together butter and sugars with a mixer on high speed until fluffy, 2 to 3 minutes. Add vanilla and eggs, and beat on medium speed until just combined. Add flour, baking soda, and salt, and beat on low speed until just combined. Stir in 2 cups potato chips and the nuts. Roll dough into 2-inch balls, and then roll balls in remaining potato chips to coat. Place cookies 2 inches apart on a parchment-lined baking sheet. Bake until golden, 15 to 20 minutes. Let cool completely on baking sheet.